The data are in. Demand for data analytics expertise has skyrocketed. The reason? A convergence of trends—the expanding universe of data, business dependence on faster, data-driven decision-making, the viral spread of social media, and huge strides in technologies that support business intelligence. Technology advancements have made new sources of information accessible, consumable, and meaningful to organizations of all sizes, including those that do not have advanced analytics capabilities. And Power BI is leading this technology revolution. What does this mean for data analysts? In this data-driven world, business leaders are confronting a new reality. There are valuable insights to be had and profits to be earned from the unimaginable amounts of data out there, but only if more data analysts have the tools to quickly and intelligently unlock them. Industry experts now predict that within two years, most business users in organizations will have access to self-service BI solutions. Tools like Power BI can help empower data analysts, reducing the time and complexity of data gathering and preparation, enabling businesses to make faster, better decisions. Learn ten ways in which your data analysis skills can help improve your career in our free e-zine It’s a Data-Driven World. More companies are realizing the strategic advantage in making modern business intelligence tools, such as Power BI, available to greater numbers of data consumers in their organizations. With more variety of data being collected at ever increasing volumes, there are more insights waiting to be unearthed by more people. Modern BI tools are helping organizations in diverse industries mine and generate value through real-time data gathering, interactive visualizations, and efficient collaboration. For data analysts, this translates into new possibilities to be had and new contributions to make. Like improving water conservation, reducing school dropout rate, anticipating market trends, and growing the next great startup. Imagine what you could accomplish with the powerful, easy-to-use data analysis and visualization capabilities of Power BI. Find out how you can tell a compelling data story. Read our free e-zine, Your Data Knows More than It’s Telling You. It’s one thing to amass data. It’s another to bring it to life in compelling ways that lead to fresh insights and faster decisions. Build personalized dashboards in minutes and share them with colleagues. Combine data from multiple sources, on-premises and in the cloud, and display them in a single report. Gather data from popular online services, such as Google Analytics, Salesforce, and QuickBooks. Ask questions using natural language. Create stunning, interactive data visualizations using drag-and-drop gestures. Stay on top of your data from your mobile device. And there’s a growing Power BI community dedicated to bringing the power of business analytics to nontechnical business users everywhere. They’re waiting for you to join. 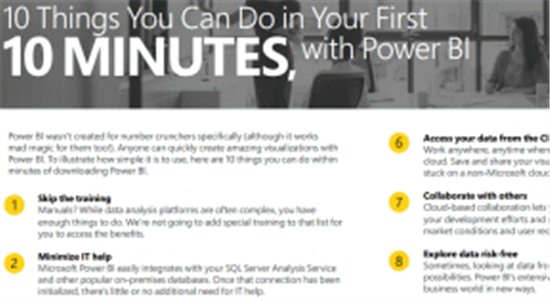 Learn more from our free e-zine Bring Your Data to Life with Power BI. Zaregistrujte se a budete dostávat novinky z Power BI přímo do vaší schránky! Power BI je sada nástrojů pro obchodní analýzy, která umožňuje analyzovat data a sdílet přehledy. Využijte možnost monitorovat vaše podnikání a získat rychlé odpovědi prostřednictvím bohatě vybavených řídicích panelů, které jsou dostupné na všech zařízeních.